Wow! What a great Value! This is perfect if you are building new, or just want to replace and upgrade swings and accessories on your backyard swingset. Perfect for Holiday or Birthday gift. 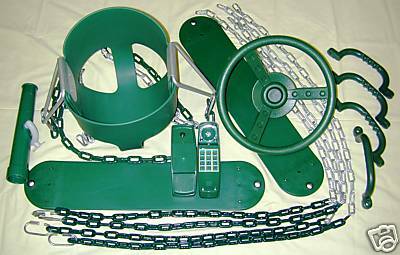 2 – Belt swings with HD 3/16"” chain, vinyl plastisol coated 30 “ of overall 61” length. 1 - Infant Swing - 360 degree bucket swing fully enclosed with HD chain, vinyl plastisol coated 20" of overall 54" length. 1 - Plastic Cordless toy telephone with ring sound on all keypad buttons. 1 - Plastic steering wheel with mounting hardware and center cap.